Whether they're the type that flop like a Basset Hound's, or stand at attention like a German Shepherd's, a dog's ears are one of the most distinguishing characteristics of any breed. Read on to learn more about the inner workings of a dog's ears, and what you can do to keep your pet's ears healthy. A dog's ears are a marvel of complex construction, giving Fido the ability to hear sounds that are far beyond the scope of human ears. Let's take a closer look, and learn how they're put together. There are two basic parts to a dog's outer ear. The pinna is the correct term for the ear flap, the most recognizable part of a dog's ears, and the one that contributes a great deal to the distinctive look of each breed. The ear canal is visible at the base of the pinna. It's a bit bumpy at it's outermost portion, and winds its way into the middle ear. The middle ear consists of a portion of the ear canal and the tympanic membrane, better known as the eardrum. Just behind this membrane are a set of extremely small auditory bones that resonate sound impulses to the inner ear. The inner ear is filled with cilia, tiny hair-like strands whose job is to convert sound impulses from the drum into electronic impulses that will be delivered to the brain via the auditory nerve. The brain then interprets these impulses as distinct sounds, such a voices, cars, other dogs barking, etc. The inner ear is also the source of your dog's equilibrium, the thing that helps him maintain his balance. Because of their tight construction, a dog's ears receive very restricted ear flow, and any moisture that makes it's way in is likely to become trapped, with little opportunity to dry out. This area, already quite warm and humid, can become the perfect environment for bacteria, and fungi to flourish and cause infection. This same environment is also attractive to parasitic mites that love to feed on wax and other debris inside the ear canal. Mites can be quite irritating to a dog's ears, and are probably best detected by the presence of a reddish-brown discharge that collects in the outer canal and base of the ear flap. 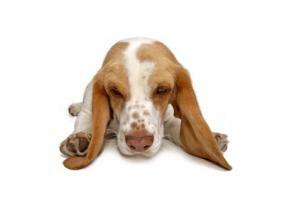 Routine cleaning of your pet's ears is a very important part of any overall dog health care program. Let's take the process step by step. Have your supplies ready and waiting. You'll need a few cotton balls, ear swabs, and a proper ear wash solution such as Oti-Clens, or OtiRinse. Begin by soaking the cotton ball in the wash solution, being careful to squeeze out the excess so your pet's ears don't become too wet inside. Now gently begin swabbing the inside of the ear flap. Change to a fresh cotton ball as needed. Next dip a cotton swab in the wash solution and carefully begin removing trapped dirt and debris from all those tight little lumps and crannies in your dog's ears. Take great care to swab only the outermost portion of the ear canal so you don't risk damaging the delicate eardrum inside. Finally, allow your dog to have a good head shake in order to remove some of the moisture from the wash. If your dog's ears have excessive hair, you can gently pull it out in small sections using a pair of surgical forceps. This will increase the amount of beneficial air flow inside of the canal. If you're uncomfortable doing this yourself, your dog groomer or vet can do the job for you. If your dog's ears still smell foul after cleaning, he might have an ear infection, and should be seen by your vet for further treatment. Cleaning your dog's ears is a very good thing, and should be done on a weekly basis for the best effect. While most owners find they have no problem doing the job themselves, never hesitate to ask your groomer for assistance. After all, your dogs ears need to last his entire lifetime. Revival Animal Health Catalog, a good source for pet ear cleaners and medications.